Kleenex is a renowned brand in the segment of hygiene products. 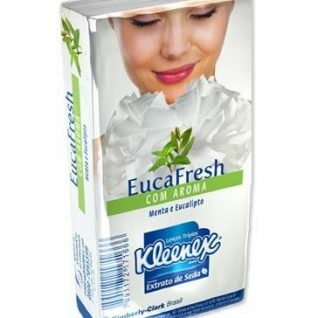 Kleenex Eucafresh are scented paper tissues in mint and eucalyptus fragance. Our goal when developing paper tissue packaging design for this line was to convey senses of well-being and freshness. Using images, colors and symbols that correctly transmit desired emotions and sensations is key in attaining a package design that quickly communicates with consumers. The result of this paper tissue packaging design is that consumer understands quickly the product attributes.